Trout is such a delicate fish that is often overlooked in favour of salmon but this is set to change with this simple Mediterranean inspired dish. Confit tomatoes are well worth the time and effort and any leftovers can also be stored in the fridge for a few days. Don’t rush the tomatoes as long, slow cooking gives the juiciest and sweetest resuts. 1. You need to start this in advance so prepare the tomatoes in plenty of time. Heat the oven to 90c/ 70fan and line a baking tray with parchment paper. Simply cut the tomatoes in half and place cut side up on the tray. Drizzle a little oil and season with salt. Roast in the oven for around 3 hours until the outside of the tomatoes have shrunk down but the centres are still juicy. Remove from the oven and cool until you need them. If you have any leftovers you can place them in a small Kilner jar, cover with oil and store. 2. When you are ready for dinner, preheat the oven to 180c/ 160 fan. Make sure the trout are well cleaned and place on a foil lined baking tray. Give the foil a quick brush with oil to ensure the trout don’t stick as they cook. For the trout stuffing, all you need to do is stuff them with lemon slices and a good sprig or two of thyme. A lot of recipes ask you to then use cocktail sticks or skewers to hold the trout together but I have never found this to be needed so long as you don’t overstuff the fish. Bake in the oven for around 20 minutes until the trout is juicy and just cooked through. Top tip: when a whole fish is cooked, the eyes will turn white as well as the flesh looking a brilliant blush colour. 3. Meanwhile, heat a few glugs of oil in a small pan with thyme sprigs, a whole clove of garlic and a couple of strands of lemon zest. Bring the oil to a bubble and heat for around 30 seconds. Take off the heat and leave the flavours to infuse. 4. When the trout is nearly ready to serve, take one medium pan and gently heat from of the infused oil. Of course, you can make the oil well in advance if you like. Add in the olives and capers and toss lightly before adding the tomatoes just before serving to warm through. At the same time, I also heated a small amount of oil in a large pan along with shallot and garlic until softened but not golden before adding the spinach and cooking covered for one minute and then seasoning and cooking for a further two minutes. Serve the tender trout with the confit tomatoes, olives and capers with the sauteed spinach and a finishing drizzle of the tyme infused oil and away you go! 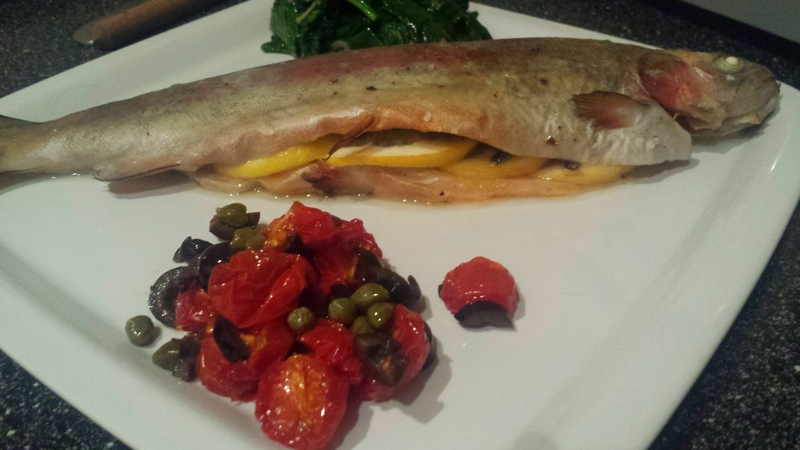 This entry was posted in Recipes and tagged black olive, capers, confit tomato, Roasted trout, sauteed spinach, spinach, whole trout by sotiris14. Bookmark the permalink.